Ali Salem Tamek, a well-known human rights defender from Western Sahara, is undertaking an open-ended hunger strike to demand his right to a university education – something he claims the Moroccan government is barring him from. Ali Salem Tamek began his hunger strike on Sunday 14 February in Assa, south Morocco. He says that the Moroccan government does not allow him to register for higher education since 2007. Though he never received an official explanation, Tamek cites his human rights activism and his political position on Western Sahara as the reasons for being denied the right to education. Tamek has been one of the most outspoken Saharawi activists for over two decades. He has been imprisoned multiple times, ending up spending years in jail, for his advocacy for Saharawi self-determination. Even outside of prison, Tamek is one of the Moroccan secret services’ favorite targets. 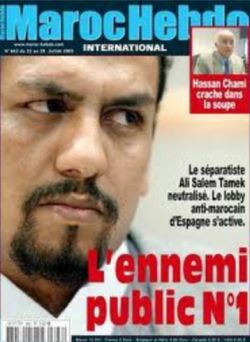 The list of state-sponsored hate crimes against the man is seemingly endless; Tamek’s face was once depicted on the cover of a Moroccan tabloid, with the caption “state enemy number 1” – putting his physical safety at the mercy of the masses. His family has been pressured to renounce him. His wife has been sexually abused by secret service agents. Tamek was denied an international passport for 12 years. He’s been committed to a mental institution. He’s been injected with unknown substances. And the list goes on. The picture above depicts Tamek on a square in Assa, where he started a sit-in 8 days ago, also in demand of his right to education. As the Moroccan government did not respond, Tamek has intensified his protest by opting for a hunger strike. Ali Salem Tamek is the vice-president of CODESA, the Saharawi Collective of Human Defenders led by Aminatou Haidar, known as the Saharawi Gandhi. He is carrying out his hunger strike in the office of the Assa chapter of the Moroccan Association of Human Rights (AMDH).